The Duomètre line gets a new member: the Quantième Lunaire shows time, date and the age of the moon with the unprecedented precision of the ingenious Dual-Wing-movement concept. 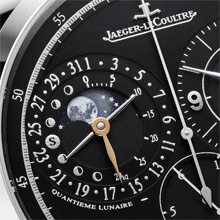 The Duomètre à Quantième Lunaire embodies the latest in horological achievements of Jaeger-LeCoultre: it displays time with a jumping seconds hand showing 1/6th of a second increments and additionally providing the date and the age of the moon in a separate sub dial. The true genius of this watch however lies within the Dual-Wing movement concept, which features two independent power supplies: one entirely dedicated to creating a perfect timing foundation – regulated by escapement and balance –, the other solely for the display of time – hour, minute and seconds hands – as well as date and the age of the moon for the Northern as well as the Southern hemisphere. Both are synchronized through the jumping seconds hand mechanism driven by the escapement. The finely grained surface treatment of the Duomètre à Quantième Lunaire’s dial reflects purity and culminates in peerless readability. 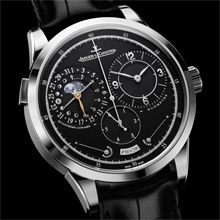 The different functions are all set apart in their own sub dials – divided according to the double-wing movement concept: Hour and minute placed on the right hand side, date and age of moon on the left, the large seconds hand at the center of the dial and the jumping second’s hand on the lower middle part. 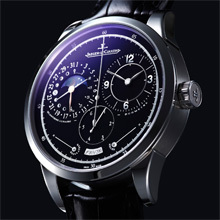 To see this exceptional movement in full bloom however, the designers have also used a sapphire glass in the case back.